No electricity needed. This economically priced pneumatic grommet press works with your air compressor making it easy to use and easy to take out on job sites, move all around your shop or even mount in your installer's truck. Our Econo-Air is a powerful compact press capable of punching a hole in a wide range of sign materials including multiple layers of banner media (going through folded banner and reinforcement webbing at one time) placing a grommet with washer in a single step. It's as easy to use as stepping on the included foot pedal. Operates at 145psi. 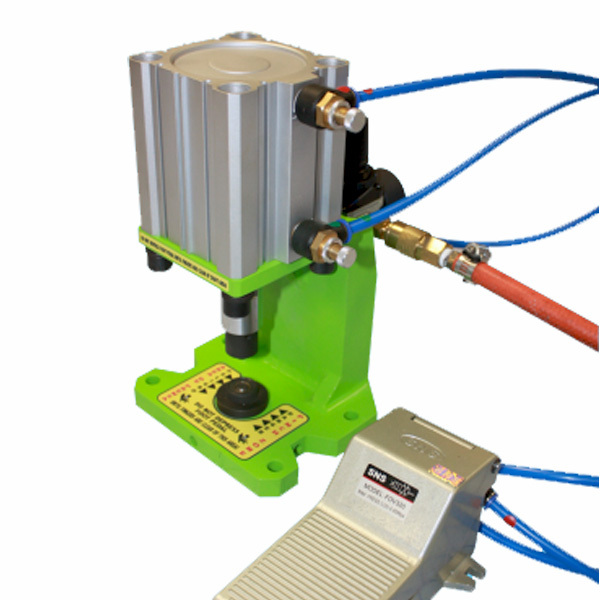 Includes: Pneumatic press with air regulator, air filter, #2 die for metal grommets. • Completely assembled. Comes as shown in the photo. • Interchangeable dies. Comes with #2 metal die. All other sizes available for additional cost. • Economical and easy to use!